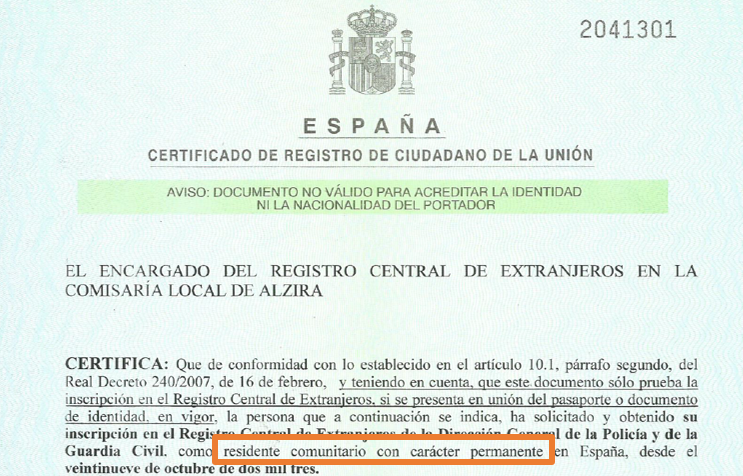 As an EU citizen you must register as a resident if you plan on living in Spain for more than 3 months. If you are here for a total of 183 days in a calendar year then you are classed as being a tax resident of Spain and should be registered as resident. You should register in person at the Oficina de Extranjeros (immigration office) in the province where you live or at the designated police station. You must be able to demonstrate that your life in Spain is financially sustainable. You will be expected to show bank statements that cover the previous three months and that you have a monthly income of above €800 per person. If you have come to Spain to work then your employer should provide you with un certificado de vida laboral – which is proof that you have work here. If you are under pensionable age then you must have proof of health insurance if you are not on contract to work. The insurance must cover everything and you may also need to show proof of payment. There are local health schemes in many parts of Spain that might be an alternative. There has been some confusion recently about the length of time a residencia applies. 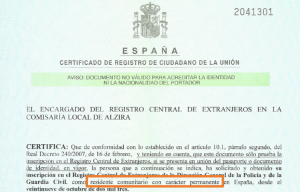 If you are a member of an EU country then your residencia does not need to be renewed. If you are not, then renewal is every five years. Older residence certificates are larger (A4 size) but are still valid. You do not need to apply for a credit-card-sized certificate unless your circumstances change (for example your address) or unless you want to. After you have been registered as a resident for five years, you can apply for a certificate of permanent residence in Spain. You will be issued with a similar credit card size Residence Certificate, but it will additionally state that you are a permanent resident (residente permanente). For those that obtained their residency card before the 29th of March 2014 and have been living in Spain since then, it will be easy to obtain a permanent residency card if they do not have one yet. 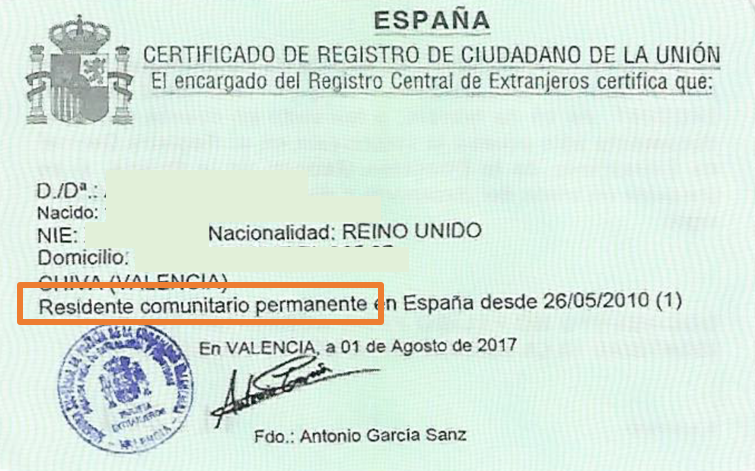 Please, check if your residency card is named as “residente comunitario” (EU citizen resident) or “residente comunitario permanente” (Permanent EU citizen resident). 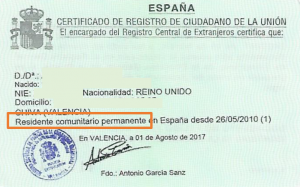 Below, you will find examples of “residente comunitario permanente”, in the two current formats. If you have “Residente comunitario permanente” on your residence card, this means that you already have permanent residence and no further action is required. Blacktower Financial Management has been established for over 32 years and have worked with clients through the good and the bad times, offering sound independent financial advice, we will be by your side both now and in the future. The above information was correct at the time of preparation and does not constitute investment advice and you should seek advice from a professional adviser before embarking on any financial planning activity. Blacktower Financial Management Ltd is authorised and regulated in the UK by the Financial Conduct Authority and is registered with both the DGS and CNMV. Blacktower Financial Management (Int) Ltd is licensed in Gibraltar by the Financial Services Commission (FSC) and is registered with the DGS in Spain.